Pruning a tree can have many benefits. The first and most important is keeping the people around it safe. A dead branch can fall from a tree at any time, endangering nearby people, buildings, and power lines. Removing dangerous limbs and maintaining a safe tree is always the best course of action. However, depending on the size of the tree and the location of the branches to be pruned, pruning itself can also be very dangerous. To ensure your own personal safety, we recommend you let an expert do any pruning you’re not absolutely comfortable and confident in doing. There are many reasons why pruning a tree is important. Pruning a tree can influence in what way the tree grows. With proper pruning, a tree can be made to grow into a certain configuration of limbs and branches that is more ideal for the structural integrity of the tree. Maintaining the tree’s structure helps to mitigate the risk of broken limbs and falling branches. A properly pruned tree will not have compromising branch structures and improper weight distribution that could lead to disaster later on in the tree’s life. Structural pruning can also greatly improve the general look of the tree. If aesthetics are important to you, proper pruning can make a tree grow in the desired fashion. Remember, it’s important that any pruning (other than emergency branch removal) be done in late fall or winter, during the dormant season. It’s during this time that the tree is least susceptible to harm that may result from pruning. Trees are susceptible to stress just like any other creature, and removing their branches does cause damage to the tree. When the tree is dormant, however, less sap is lost and, since they are dormant as well, insects and fungus are less likely to further damage the tree. Certain species of trees require more precise timing and different approaches for proper pruning. 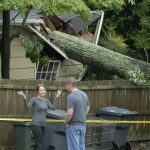 If you’re ever in doubt, contact a certified arborist instead of risking both the tree’s safety and your own. It’s also important to remember not to prune too much off of a tree. Generally, you want to prune the smallest amount you possibly can that achieves the desired effect. Never prune more than ¼ of the crown of a tree, as this is where most of its leaves are located and consequently where it gets most of its energy. You run the risk of fatally damaging the tree if too much is pruned too quickly. 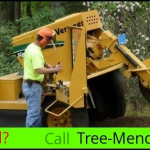 Again, a certified arborist is your best bet if you want the job done properly and safely the first time.